Located in the growing suburb of Apopka, the Apopka Land Regional Shopping Center is the retail anchor of this bedroom Orlando community. The 171,202 square foot formerly Food Lion anchored center sits comfortably between SR 441 and SR 436, having direct access and signage from both thruways and a traffic count of over 50,000 vehicles per day. 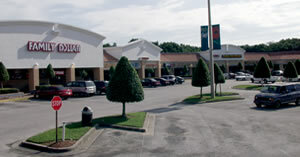 The property was purchased in 1999 by ZR Apopka along with a Wal-Mart owned separate parcel to be combined into what was then renovated and re-tenanted to include junior anchors Beal’s Outlet and Dollar Tree. The new facades, added signage, and improved lighting increased the vibrancy of the site. Two new out parcels were created. The center was sold in 2003.